The services and supports an individual receives is tailored to meet that person’s own hopes, dreams, desires and needs. At Dungarvin Wisconsin, we are committed to our mission of “respecting and responding to the choices of people in need of supports”. Many people with developmental disabilities require some assistance in order to live a full, productive and rich life. This assistance may be required whether a person lives with family, in a group home or in his/her own apartment or home. The services and support a person receives through Dungarvin can include assistance with personal hygiene, maintaining a healthy lifestyle, accessing the community, learning to cook, and budgeting finances as well as many other services. Dungarvin Wisconsin works cooperatively with each individual, his/her family, support team and county/state/family care entities to ensure quality services. Dungarvin Wisconsin has a reputation for supporting people who have complicated medical and/or behavioral support needs. Through extensive training of our staff and expertise at all levels of the agency, Dungarvin has proven to be successful in providing supports to those individuals who have complicated needs. If you are interested in services from Dungarvin, or need more information about current openings or future placements, please contact us! For more information on supports for people with developmental disabilities in Wisconsin, contact the Community Alliance of Providers of Wisconsin or the Wisconsin Department of Health. Dungarvin Wisconsin partners with Sengistix in a number of locations. Sengistix utilizes a wide variety of coordinated sensors and other technology to provide a “complete package” of custom monitoring tailored to meet unique individual needs. This automated sensing and technology support improves safety, enhances the quality of life, and increases options for greater independence for all individuals requiring support. For more information Sengistix, please visit our Partners. Each person is unique and no support model meets the needs of everyone. Therefore, Dungarvin provides many different types of support. Please contact us for more details and/or to discuss any additional needs. Dungarvin provides a gamut of supportive employment services. We can assist an individual with the initial stages of the assessment period, job searching and development, job coaching, and working independently. These are 1-2 person homes that are usually certified by the county. Typically, Dungarvin Wisconsin either owns or rents the home. Dungarvin provides 24-hour support in daily living skills, money management, health maintenance and community integration. These are 3-4 person homes licensed by the state of Wisconsin. Typically, Dungarvin Wisconsin either owns or rents the home. Dungarvin provides 24-hour support in daily living skills, money management, health maintenance and community integration. These are apartments available for rent by the general public. Generally the apartments are clustered next to or across the hall from each other in an apartment complex. Typically each individual rents his or her own apartment. Dungarvin Wisconsin provides 24 hour staff support including budgeting, cooking and assistance with maintaining their living situation within the community. 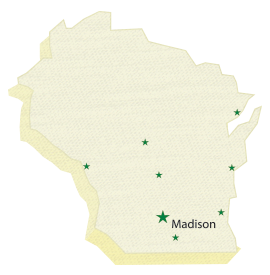 These are 5-8 person homes licensed by the state of Wisconsin. Typically, Dungarvin either owns or rents the home. Dungarvin provides 24-hour support in daily living skills, money management, health maintenance and community interaction. Individuals who receive drop -by supports live in apartments available for rent by the general public. Depending on his or her financial status, a person shares an apartment or lives alone. Dungarvin Wisconsin provides as little as 1 hour a week to 16+ hours a day. The level of service and support depends on the needs of the individual. Typical supports include money management and access to community services.